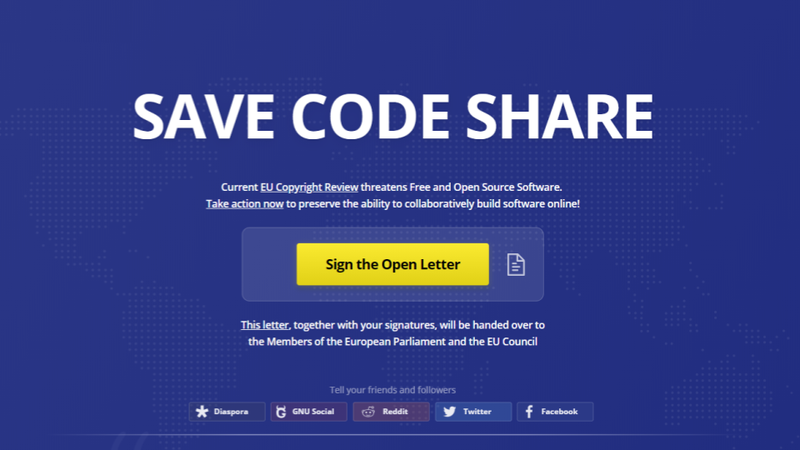 SaveCodeshare.eu Campaign successful: Free and Open Source Software Development Saved from Upload filters. Yesterday, the European Parliament passed the Copyright in the Digital Single Market Directive, including articles 11 and 13. The consolidated trilogue text was approved by 348 votes in favour, 274 votes against and 36 abstentions. As a think tank working for Openness in IT markets, we see this as a bad blow to the Open Internet, and Openness in general. As for the goal of the SaveCodeshare.eu campaign, we managed to exclude “open source software development and sharing platforms” from the Directive’s scope, which was the most direct threat to Free and Open Source software development in the text. OpenForum Europe and the Free Software Foundation Europe will follow the transposition processes (making the Copyright Directive actual Member State law). An exclusion in a Directive is not as written in stone as a regulation, and we need to make sure that our exclusion does not get lost in translation. We will call on our like-minded parties to help us in this process. One positive note: our campaign and efforts, not just in Brussels but also in the Member States, have led to increased knowledge of FOSS among more policymakers. This means that if or when we need to save FOSS from other efforts to close the digital space in Europe, we have a stronger foundation to advocate from. We also have a reinvigorated network of FOSS advocates. At OFE we will dedicate our future efforts to connect advocates, academics, experts and policy makers to discuss positive and proactive efforts going forward. Lastly, thanks to all of you that spoke out and supported our campaign!